An intensive introduction to hand tool woodworking and methods in traditional joinery. Traditionally woodworkers (joiners) learnt their craft working as an apprentice in the Master Craftsman's shop doing the grunt work and learning by assimilation over many years. Our approach is a little different. We're making the assumption that you're smart; are developing or already have a passion for woodworking; and can devote three months to intensive learning. This course will drill deep into the basics, beginning with a firm foundation in understanding wood as a material and incorporates introductory training in a wide range of techniques. You'll leave with a in depth experience of hand tools, practice applications of joinery methods, consider choices for wood selection and working with non-toxic materials, and understand practical planning for designing and executing woodworking projects. The curriculum focuses on imparting skills through a series of projects designed to build on one another in techniques and complexity. We follow many traditional standards because they impart the work ethic of doing things right, emphasizing quality, attention to detail, considering impact and longevity, and working to high standards for lasting work. Our instructors are experienced craftspeople who recognize the value of passing on their skill set to the next generation of woodworkers. We strive to invite you into our community by connecting you with others who have a passion for craftsmanship. We're committed to passing on the living tradition of woodworking--rooted in techniques that create lasting results and instilling the values and practices of fine craftsmanship, sustainability, and creative expression. 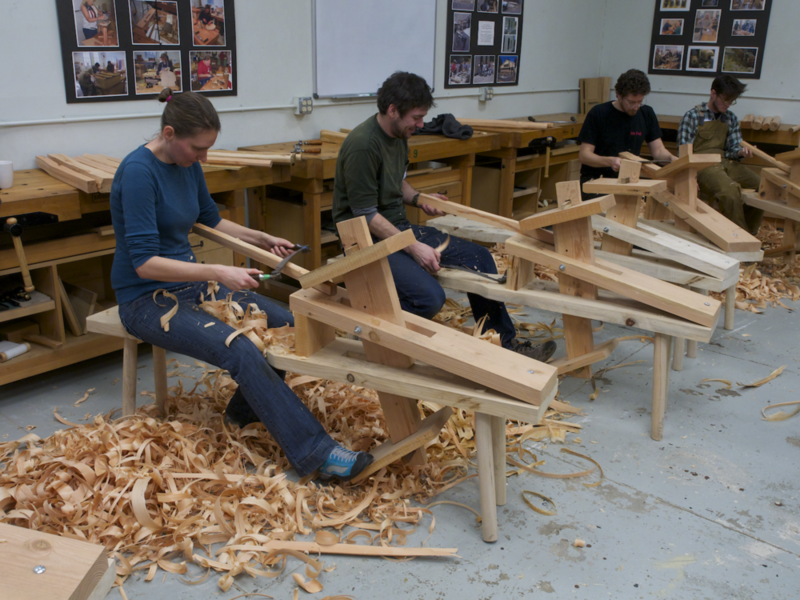 In the Port Townsend School of Woodworking’s twelve-week Woodworking Foundation course, you will learn the essential skills, tools and mindsets of the traditional joiner. This is NOT an industrial arts course with a focus on machinery and production processes. Rather, it is a course in PRE-industrial artisanship--the creation of individual works through mostly hand tools and skills..
For most of the course, we'll be heavily focused on developing your skills using hand tools. As a developing woodworker, there is no substitute for putting in the hours of direct hands on practice it takes to gain an intuitive understanding of wood. The early part of this course focuses on working with hand tools as we believe they bring you closer to wood as a material. You can rip a board on a table saw with out much thought to the wood itself, but you will understand much more about grain if you rip a board with a hand saw. As the course progresses, machine processes are introduced as a pragmatic aid in expediting projects. On completion, you will graduate with a set of self-made tools, fixtures and storage units (not to mention the skills required to build them) that will serve and last you the rest of your life. You’ll be amply prepared to continue your woodworking education into specific trades such as architectural woodworking (finish work); custom door and window construction; solid-wood furniture and cabinetry; and boatbuilding. Over the course, we invite guest lecturers from the community to share their experience of becoming vocational woodworkers in these trades. Understanding how wood works: effects of working with and across grain; of density and other fundamental characteristics. How and why wood moves. Selecting and dealing with figure. Selecting and conditioning wood for various applications. Introduction to designing wooden structures of beauty and integrity--from pre-industrial (geometry-based) to machine-oriented strategies. Selection, orientation and sizing of joints. Sawing components to width and length with handsaws at a sawbench. Construction and use of a bench hook and shooting board (for precision cutting and trimming at the workbench. Truing faces and edges with try, jack and block planes. Introduction to the design, construction and use of the straightedge; try-square; marking gauge and winding sticks. Creation of story sticks, templates, component and cutlists. Layout and construction of frame and panel structures. Making mortises with mortise chisels. Making and conditioning riven pegs for draw-bored tenon joints. Cutting out tenons with back saws. Use of smoothing planes for final surfacing of components. Choosing and applying traditional finishes like shellac and Tung oil. Safe practices for handling finishing rags. Efficient and effective sharpening and maintenance strategies are taught and practiced for all the hand tools used in this course. The projects in this course follow a natural progression of skills, techniques and tools. Some of the early student-made tools are, in fact, used to help make the next tool or bench fixture in the series. You are supported in the building of these projects with step-by-step outlines, knock-down examples and continuing, one-on-one consultations with the faculty. Periodic evaluations of your progress with a specific faculty-mentor help keep you on track. The description below is an outline for how the course will proceed. We intentionally maintain a level of flexibility in our curriculum to adapt and respond to the needs of each group of students depending on aptitude. Each project has a basic standard of completion as well as design opportunities for elaboration and exploration of more advanced techniques. Our instructors will guide you through projects as is best suited for your ability level. As time allows, classes may also get the opportunity to practice coopering, tool restoration, turning on a lathe, steam bending, carving, or toolmaking. Working with wood fresh from the log, this green woodworking project is the perfect introduction to edge tools and wood grain. In the first week you will produce a three-legged stool using buck and “whip”saws for crosscutting the log to length; wedges and froes for splitting out leg stock; drawknife and spokeshaves at a shaving horse for shaping the legs; and using travishers, rounding planes and specialized rasps for shaping the seat. You may optionally also build a layout square; panel gauge; wood-bodied hand plane; and a chisel mallet from kits available for purchase from the school. In the middle third of the course, you’ll build a tool tote that features dovetails joining bottom-to-end boards; rabbeted and copper-nail pinned side boards; shaped end panels and curved handles passing through angled mortises. This joiner’s tote also features a lift-out box for layout tools with lapped (or optionally dovetailed) corners and a sliding lid. This intermediate project builds on the rabbeting and dovetail joinery skills from the tool tote and introduces carcase construction techniques including building and hanging a frame and panel door. The last third of the course is dedicated to a frame and panel chest. Working within a set of guidelines, students will go through the process of drafting, designing, selecting wood, processing stock, cutting joinery, and exploring finishing and decorative details. This project has the most flexibility in design opportunities for embellishments, and instructors will help guide students towards project goals that are both challenging and appropriate to their skill levels. With the Grain: A Craftsman’s Guide to Understanding Wood by Christian Becksvoort. A little knowledge about trees goes a long way toward improving your woodworking. You don’t need a degree in dendrology to build a desk. But you do need intimate knowledge of how our raw material grows and – more importantly – how it responds to its environment after it has been cut and dried. The New Traditional Woodworker by faculty member Jim Tolpin. This is an introduction to hand tools (and the projects in the class) that shares Jim's thinking about the mindset needed to be a hand tool woodworker. If you have a copy of the book, bring it to class. If you don't have a copy we'll supply you with one the first week of class. The cost can be deducted from your materials deposit and you will have time to read it before the second week when you begin to put the information from The New Traditional Woodworker into practice. Class hours are 9:00 to 5:00 Monday through Friday with an hour break for lunch. Students should be expect to come in at 8:30 to practice and prepare for the day. The workshop is fully available to students during class time Monday through Friday. After the first four weeks of the class, the bench room is available after hours and on weekends. The School is fully equipped with sets of high quality hand tools for each workbench. You do not need to bring tools to this course. We recommend not buying tools prior to the class but suggest that you use the school's tools and let that experience guide your purchasing decisions. You are welcome to bring any tools you already own. This class is open to novice woodworkers and to more experienced woodworkers who would like to broaden (or simplify) their approach to woodworking. What do we mean by novice? We think it means you are a person who has decided to commit to learning new skills; to growing a passion for the craft of working with wood; and has a strong sense of the limitations of your own knowledge. We prefer that you have some experience of woodworking before taking this class. If you have no woodworking experience - we’d like you to produce evidence of strong practical skills, problem solving ability, and experience with hand work (we can do this in a phone call). We're looking for the right attitude. There is no fee to submit an application! Once your application is accepted and you are invited to register, a deposit of $200.00 is required to hold your place in the course. The remaining tuition payment ($7,000.00) and materials deposit ($300.00) is due 45 days before the start date. Any unused materials deposit will be returned at the end of the course. You may use the materials deposit to buy books, finish, wood, fasteners, and hardware. Due to credit card processing fees, we kindly ask that students make this portion of the tuition payments by personal check, money order, or bank check. This course runs during the off-season in Port Townsend. Vacation rentals and house shares can be picked up in town. Our School fund-raises so that we can offer scholarships for the Foundation Course. Our ability to offer scholarship depends on us having funds available and requiring that students meet the conditions that donors attach to the funds. Goddard College accepts the satisfactory completion of our Woodworking Foundation Course for 12 semester units of transfer credit. See the Goddard College site for further details on programs, degrees granted, and transfer credit details. Find out more about our vocational option and see our vocational catalog. Foundations of Woodworking runs every fall (September - December) and winter (January-March). The application process for each session opens 9 months in advance of the course start date. Applications will be considered for registration in the order in which they are received. There is no fee for applying. Accepted applicants will be invited to register. We ask for a deposit of $200 at the time of registration to ensure your place in the class. If the class is full and you would like to add your name to the waitlist, simply fill out an application and we will contact you as soon as a space opens. You should receive a confirmation email after you submit your application. Please contact us if you do not receive a confirmation.